A bamboo shoot is the start of a young bamboo plant that, if not harvested, will grow into a tall bamboo plant. The leaves that cover the shoot are black and covered with tiny hairs. The black leaves are peeled off until you can see the off-white meat inside. The white meat turns yellowish after it is cooked. When the shoot is cooked on the day it is harvested it is very sweet. There are many different types and sizes of bamboo shoots depending on the plant. Big ones are usually sliced and used as an ingredient in a main course dish. The little ones(half an inch in diameter) are cut into finger size pieces and eaten as a vegetable with sauces like nam prig gapi. 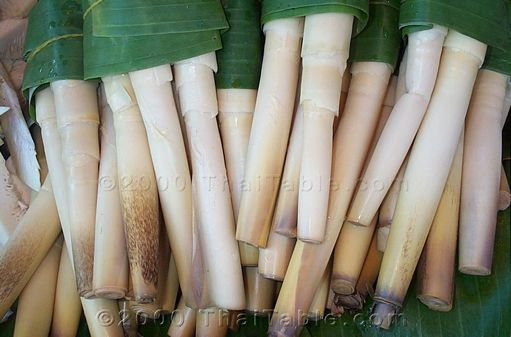 In Thailand, bamboo shoots are available fresh during the rainy season, May through October. Otherwise, they are available in cans and jars. Outside of Thailand, bamboo shoots come in cans and glass jars, pickled or sour, non-pickled and with bai yanang. For the recipes here, unless otherwise specified, use the plain non-pickled shoots. Recently, I have seen fresh bamboo shoots at Asian Markets in the US.